Virgin Mobile on Tuesday announced no-contract unlimited 4G WiMAX “higher calling” plans. The plans will include unlimited data and texting and start at $35 per month. The carrier will offer a new device called the EVO V 4G, which looks nearly identical to the original EVO 4G. The EVO V 4G offers a 4.3-inch qHD display, a 1,730mAh battery, 1GB of RAM, 4GB of storage, a 5-megapixel camera capable of recording 3D photos, a 1.3-megapixel front-facing camera for video chat, Android 4.0 Ice Cream Sandwich and Sense 3.6. “’Higher Calling’ means we continue to look for ways to give our customers the best products possible at a great price, and we know our hyper-connected Beyond Talk customers will appreciate the real affordability paired with the innovative technology of the HTC EVO,” said Jeff Auman, vice president for Virgin Mobile USA. The phone will launch on May 31st for $299.99 without a contract. WARREN, N.J. (BUSINESS WIRE), May 08, 2012 – Virgin Mobile USA continues to demonstrate how it’s answering to A Higher Callingwith the speed of 4G, by offering customers who prefer a no-contract option the fully loaded HTC EVO™ V 4G on Virgin Mobile Beyond Talk monthly plans. The data-centric offers start at $35 per month for unlimited data and messaging. HTC EVO V 4G will be available for $299.99 beginning May 31. On the mobile broadband side, Virgin Mobile’s Broadband2Go continues to offer no-contract plans ideal for people who need internet access when they’re out and about. The versatile Overdrive Pro™ 3G/4G mobile hotspot by Sierra Wireless ($149.99) and the powerful U600 3G/4G USB Stick by Franklin Wireless ($99.99) provide customers two ways to stay connected at 4G speeds. “The launch of these two devices demonstrates our commitment to bring 4G speeds and innovation to our Broadband2Go customers who chose to forgo a contract as well,” said Auman. All three devices will operate on Sprint’s 3G and 4G (WiMAX) network and be available beginning on May 31 atVirginMobileUSA.com. They will then be available in June at major retailers and at select independent dealers nationwide3. 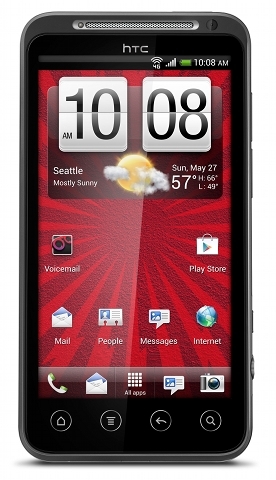 The HTC EVO V 4G strengthens Virgin Mobile USA’s Android-powered smartphone lineup by adding such features as Android 4.0, Ice Cream Sandwich and HTC Sense 3.6 user interface. HTC EVO V 4G customers will enjoy Virgin Mobile USA Beyond Talk plans starting at just $35 a month for 300 minutes of voice with unlimited messaging and data.4 And the mobile hotspot on the HTC EVO V 4G can be added for this device on any Beyond Talk plan for an additional $15 per month. Virgin Mobile’s new monthly 3G/4G Broadband2Go plans, combined with these new devices, allow customers to hook up their tablets, laptops, and other wireless devices. Starting at just $35/month, customers can enjoy access to unlimited 4G data. Where 4G coverage is not available, the $35 plan keeps you connected with 2GB of 3G data. For $55/month, customers benefit from unlimited 4G data and a whopping 5GB of 3G data. The Overdrive Pro 3G/4G mobile hotspot connects up to five Wi-Fi enabled devices, making it ideal for families on-the-go and independent professionals. The compact device has top battery strength and a 1.7-inch LCD screen that makes setting up a cinch. It also offers a microSD slot for up to 32GB of shared network storage. The U600 3G/4G USB Stick supports Mac OS and Windows, and a rotating connector makes it easy to fit in most laptop configurations. Setting up your Broadband2Go account is extremely simple, and there are no activation fees. Top-Up can be handled online with a Virgin Mobile Top-Up card, debit or credit card. Sprint 4G (WiMAX) is currently available to 120 million people in 71 markets across the country with average upload speeds of between 3-6 Mbps, with bursts of more than 10 Mbps.